Jewish paper cutting art is an ancient folk art dating to at least the Middle Ages, probably further than that but paper doesn't last so well. 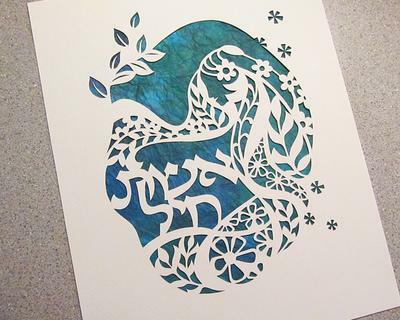 There are many Jewish paper cutting artists working today, like Kim Phillips of Hebrica Judaic Art. More of her work can be seen at Hebrica Papercut Art. Read more about the artist Kim Phillips. You can see her recent special made paper cutting art for her friend's memorial Eshet Chayil, A Woman of Valor.